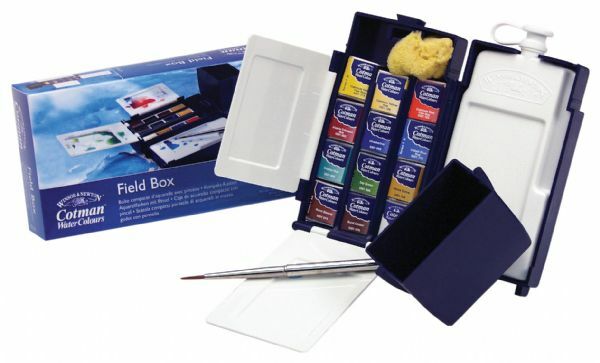 * Set contains half pans in 12 colors: Cadmium Yellow Pale Hue Cadmium Yellow Hue Cadmium Red Pale Hue Alizarin Crimson Hue Ultramarine Cobalt Blue Hue Sap Green Viridian Hue Yellow Ochre Burnt Sienna Burnt Umber and Chinese White. * Also include pocket brush sponge three mixing areas 35 ml capacity water bottle clip-on water container and instructional leaflet. 5" x 2.75" x 1.5"